Today's post is all about beautiful florals, gorgeous patterns and classic items that you'll want to use again and again! And the best part is that many of today's new products can be adapted to fit a variety of styles…..truly a little something for everyone! You're sure to be inspired by these amazing new products! The original intent of this set was a beautiful option for creating Thanksgiving themed projects, but it is definitely versatile enough to be used for many other occasions as well! 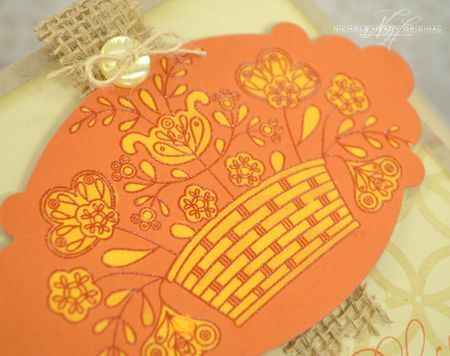 The detailed folk themed basket of flowers can be used as an outlined image and colored with your favorite coloring medium, or there are solid stamps included for multi-step stamping options. The sentiments give you lots of variety as well. You can use one of the larger script words by themselves or pair them up with some of the lengthier companion sentiments. The companion sentiments could also work well for the inside of a card. Basket of Blessings will be available for purchase on August 15th. Basket of Blessings contains a total of 30 images. The entire flower basket image measures 3-1/4" x 2". "Thanksgiving" measures 2-7/8" x 1-1/8". "Thank you" measures 2-3/4" x 1-1/8". "Blessings measures 2" x 7/8". "Grateful" measures 2-1/8" x 1". "Today, let us be thankful for the food…" measures 2-1/2" x 1/2". "For the beautiful ways you bless my life." measures 1-3/8" x 3/8". "Give thanks for unknown blessings…" measures 2-1/4" x 3/8". "Let us be grateful to people…" measures 2" x 3/4". "Let us give thanks for each new morning…" measures 2-5/8" x 7/8". This two-part background building set allows you to combine layers of color and pattern for stunning results. You will love having the ability to use the pattern strips individually if desired. The single medallions feature the same version of the patterns, allowing you to quickly add-on or touch up where necessary. Background Basics: Morocco will be available for purchase on August 15th. Background Basics: Morocco contains a total of 5 images. The large open medallion strip measures 6" x 2-1/8". The smaller medallion strip measures 5-5/8" x 7/8". The large individual medallion measures 7/8". Dawn McVey is the queen of all things floral and this new set really embraces her love for all things botanical. Add the perfect autumn touches to your paper creations with an essential fall flower — the mum! Mum’s the Word has a gorgeous collection of images that will allow you to build your own floral scenes featuring detailed mums as well as a collection of versatile sentiments appropriate for a variety of popular occasions, which will surely have you reaching for this set all year long! Mum’s the Word will be available for purchase on August 15th. Mum’s the Word contains a total of 17 images. The largest mum image measures 2" x 1-3/4". The smallest mum image measures 1-1/8" x 7/8". The “Thank You” sentiment measures 2" x 1/2". A coordinating die collection will be available for sale separately, retailing for $8. This collection includes a total of 2 dies (3 wired shapes + 6 wired shapes). They measure 3-3/4" x 2-1/2" (A), 1-3/4" x 1-7/8" (B). Dawn McVey has done an incredible job on her new addition to the Boutique Borders collection this month. This stunning sympathy set is the seventh set in a monthly series of gorgeous frame images and classic sentiments with beautiful font combinations as well as coordinating dies. Each month features a new frame image as well as a new sentiment theme. Use the frames with the Boutique Borders sentiments or use them with any number of sentiments and images from your own stamp collection! The Boutique Borders series is so versatile you’ll want to collect them all….you’re sure to find yourself reaching for these again and again! 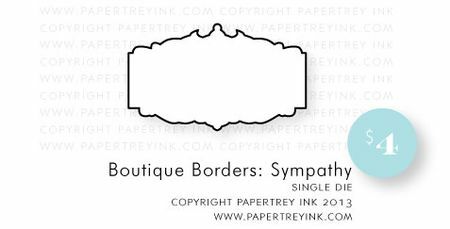 Boutique Borders: Sympathy will be available for purchase on August 15th. Boutique Borders: Sympathy contains a total of 5 images. The frame image measures 2-1/2” x 1-1/2”. The “With Sympathy” sentiment measures 2-3/8” x 7/16”. The “I’m here for you” sentiment measures 2-3/8” x 3/16”. A coordinating die will be available for sale separately, retailing for $4. This die measures 2-7/8" x 1-5/8". Lizzie Jones has designed a great new basic that you simply won't be able to put down — the Rustic Burlap Impression Plate! A much bolder texture when compared to the popular Linen & Canvas, this will be the perfect touch to your fall themes projects! Rustic Burlap Impression Plate will be available for purchase on August 15th. Rustic Burlap Impression Plate measures 5-3/4" x 4-1/2". For my first project today I wanted to do a bit of watercoloring with the detailed basket image from Basket of Blessings. I heat embossed it onto white cardstock using White Filigree Embossing Powder. I then used ink refills and water with a small watercolor brush to add color to the image. An important thing to note when doing this is to be sure to go outside of the lines a bit so the whit embossing provides more contrast. For the sentiment, I stamped the large "Grateful" and "for you" in Soft Stone underneath the basket. I then added the second companion sentiment under that using Charcoal Palette ink. This is one of my favorite quotes and I was so happy to be able to include it in this set! I pierced some holes along the center of the card using a ruler and paper piercer and stitched them with white crochet thread. I left the ends intact and knotted each of them to prevent the stitching from pulling out. This project shows you what kind of magic you can make with Copic markers and the basket image. I used various Copics (see supply list for colors) to color the image in after stamping it with Noir Palette ink. I added a bit of T1 around the edge of the image to help add depth. 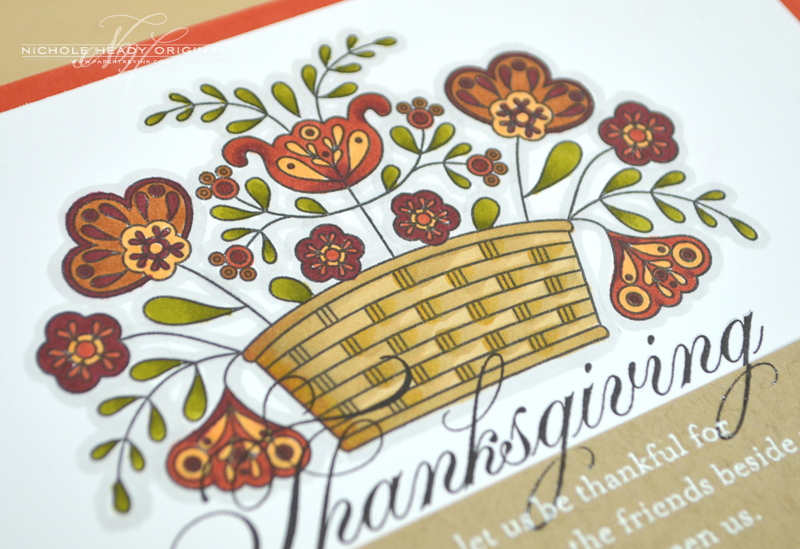 I stamped the gorgeous script "Thanksgiving" in True Black ink, overlapping the basket image slightly. I then cut a strip of Classic Kraft cardstock and added the loops of the two "g" letters in Thanksgiving to the top of it. The companion sentiment was heat embossed with White Filigree Embossing Powder. The Classic Kraft strip was adhered so that the g's lined up with the image underneath. My next card has a bit of a softer look to it and shows how the basket looks when "colored in" with the included solid stamps. I stamped the main basket image in Dark Chocolate. I then followed up and added the solid stamps using Simply Chartreuse, Melon Berry, Ocean Tides, Summer Sunrise and Classic Kraft inks. The finished block was impressed with the Rustic Burlap impression plate. I just LOVE this new impression plate. IT is like a more pronounced version of the Linen & Canvas impression plate, and makes a much bolder statement especially when used on top of images like this. The "Thank You" sentiment was added along the side of the card using Dark Chocolate ink, followed by the smaller companion sentiment. Three small stitches with embroidery floss he,p to add balance to the vertical sentiment. The entire Classic Kraft card front was swiped with Vintage Cream ink to help add softness. For this project I used a fun bleaching technique to get another look from the basket. 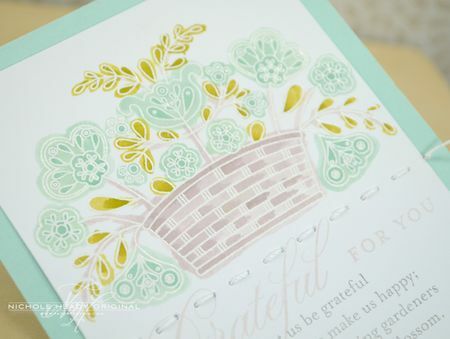 I heat embossed the basket image onto Canyon Clay using Clear Filigree Embossing Powder. I then used a paint brush to add a bit of bleach to each part of the image. After it was dry, I die-cut it with the largest Mat Stack 6 Collection die. I added a strip of burlap underneath the focal point, looping it at the top and notching it at the bottom. A small Harvest Gold button tied with twine embellishes the top. On the bottom half of the card I stamped the sentiments in Canyon Clay and Dark Chocolate. 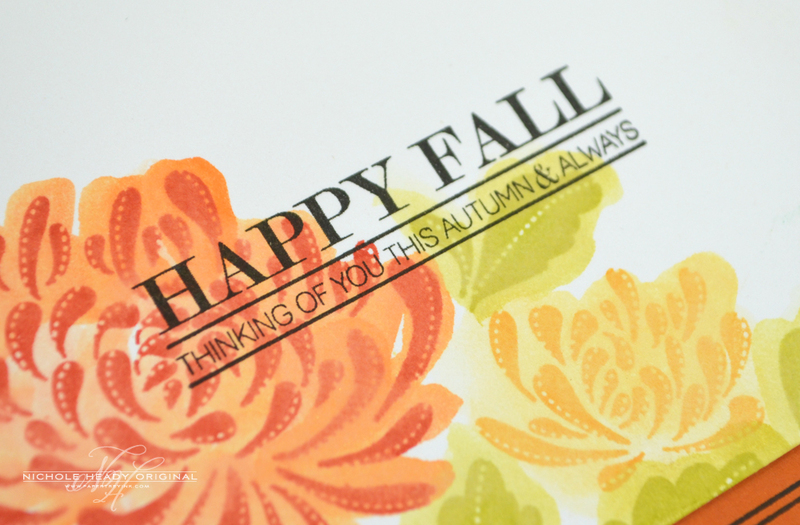 I then added this icon from Autumn Pattern Pieces repeatedly over the sentiments using VersaMark ink. The edge of the Fine Linen layer was edged with the Tea Dye Duo. Everything was adhered to a Classic Kraft card base. This is a super simple card in design and I just love the way it turned out! 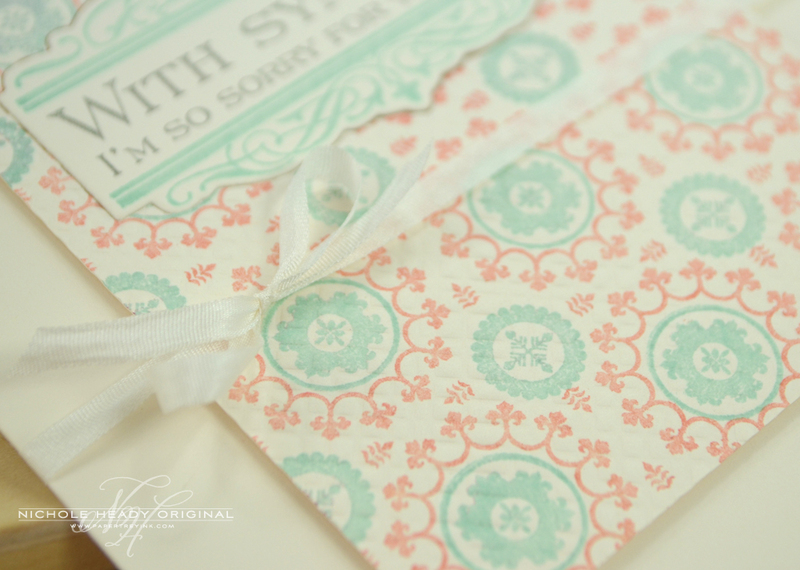 I stamped a block of Vintage Cream cardstock with Background Basics: Morocco using Melon Berry and Aqua Mist inks. I then die-cut the Boutique Borders: Sympathy frame from the patterned block and replaced it with a plain version die-cut from Vintage Cream cardstock. I stamped the frame in Aqua Mist and the sentiment in Charcoal Palette. After adhering all of that to a Vintage Cream card base using foam tape, I tied 1/8" silk ribbon around it and finished it with a bow. 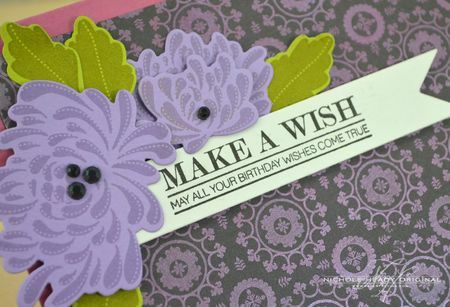 You could recreate this card with alternate color schemes and any of the Boutique Borders stamp sets and dies. It had been a bit since I had pulled out my Perfect Pearls and I really wanted to experiment using them with the new Background Basics: Morocco set. I stamped the background onto Smokey Shadow cardstock using Fresh Snow ink. I then brushed on Forever Violet Perfect Pearls using a soft brush, cleaning the excess off using a Swiffer dusting cloth. It really made for a gorgeous look. I die-cut a strip of Soft Stone cardstock with a Sketch Shapes die and added the sentiment from Mum's the Word in True Black. The mums were die-cut from Winter Wisteria and stamped in the same color. The leaves were cut from Simply Chartreuse and stamped in Ripe Avocado. I layered the die-cut flowers using foam tape and finished their centers with black rhinestones. I decided to use Autumn Rose as a bit of an unexpected color for the card base. This card is as easy as it gets. I wanted to try something that involved stamping the mums and leaves all in the same color and this is what I came up with. I masked the center of the white cardstock and stamped Background Basics: Text Style using Simply Chartreuse ink. I then removed the mask and added the mums using Ripe Avocado ink. The finishing touch was the sentiment from Boutique Borders: Sympathy added in True Black. I added a few small dots of black ink to the centers of the flowers using a pen to help carry over the black used in the sentiment. Everything was adhered to a Simply Chartreuse card base. For my last project today, I wanted to do a bit of watercoloring with Mum's the Word. I stamped the flowers in Terracotta Tile and Summer Sunrise, the leaves in Simply Chartreuse. I then used the coordinating ink refills and water to add some swipes of color over each of the images. After the flowers had dried completely, I added this sentiment in True Black. The focal point was adhered to a Canyon Clay card base. I used a black pen and ruler to add a frame around the flowers to help ground them. I hope you have enjoyed all the creations that I have shared with you today! And hopefully you're feeling inspired to get crafting yourself!! What's topping the charts for you today? We would love to hear your initial thoughts on everything we introduced! Please leave a comment on this post to tell us what you think of the new products and you will be eligible to win big! You have until 7am EST, August 13th to leave your comment and be eligible to win. Only one comment per person please. One randomly selected winner will be announced on our August Release Winners Page before noon EST the same day. Thank you for stopping by today and best of luck with the contest! Ashley Cannon Newell will be showcasing Basket of Blessings and Background Basics: Morocco. Dawn McVey will be featuring Mum's the Word and Boutique Borders: Sympathy. FINISHED SIZE: 6" x 4-1/2"
FINISHED SIZE: 4-1/4" x 6"
It’s preview “hump day” almost time to place our orders!! Gorgeous cards! I’m loving the Moroccan backgrounds! Wha t lovely projects. Love the mums, and sympathy. Its a perfect go to sympathy sentiment. Thank you for helping me gracefully step into Fall!! You’ve stolen my heart with “Mum’s the Word” and the fall colors!!! Love the details – stitching, burlap, buttons, etc. that make your cards extra special! Mum’s the word looks like it will perfectly using the white embossing powder and copics technique. I can’t wait to add it to my collection! Your cards are just stunning. What beautiful sentiments and colors this month. Amazing projects, love it all!! I’m looking forward to seeing the whole sets! Oh I can’t wait to order ALL of these. I love images from nature and I think that the sentiments that go with them are particularly beautiful. I love summer, but these cards and ideas make me really excited to see the arrival of fall. I really like the use of the multiple layer stamps! What a great idea. I love the sentiments you showed today! Love the projects and products today. Wasn’t liking the basket set till I saw the sentiments. Now I want those for making gratitude journals. Beautiful. Love love the basket of blessings stamp set. Gorgeous. Not to speak about mum’s the word stamp set. Gorgeous new sets. Lovely basket, lovely sentiments, lovely backgrounds… perfectly lovely! Beautiful cards-such wonderful inspiration. I can’t wait to see the entire sets. Beautiful projects, once again! The new background set looks amazing. I love that it can be stamped in different colors. The basket is beautiful and those mums. Gah! 🙂 Another great sneak! Beautiful cards today. I especially love the Thanksgiving set, the sentiments are perfect! I love the mums and the sympathy set! Beautiful cards! Simply love those Mum’s! Beautiful projects Nichole. So excited by the new stamp sets and dies. I especially love ‘Mums The Word’ set. Beautiful projects today. I am crushing on that Moroccan background. Love the morrocan theme and the beautiful flowers! Mums and Morocco – loving the projects today! Very pretty floral sets. Love the basket with all the Thanksgiving sentiments. Beautiful! I am loving every minute of it! The mum images are beautiful and elegant. Just breathtaking! Oh, I love the mums, the basket of blooms, and the awesome sentiments I’m seeing…! Can’t wait to see the sets in full! You are the Queen of Stamping – they are all bea-u-tiful! Love the Morocco background! The the Morocco background is lovely! I love that last card with the watercolor shadows. Beautiful projects today! The new background set looks amazing. I love that it can be stamped in different colors. What amazing projects! 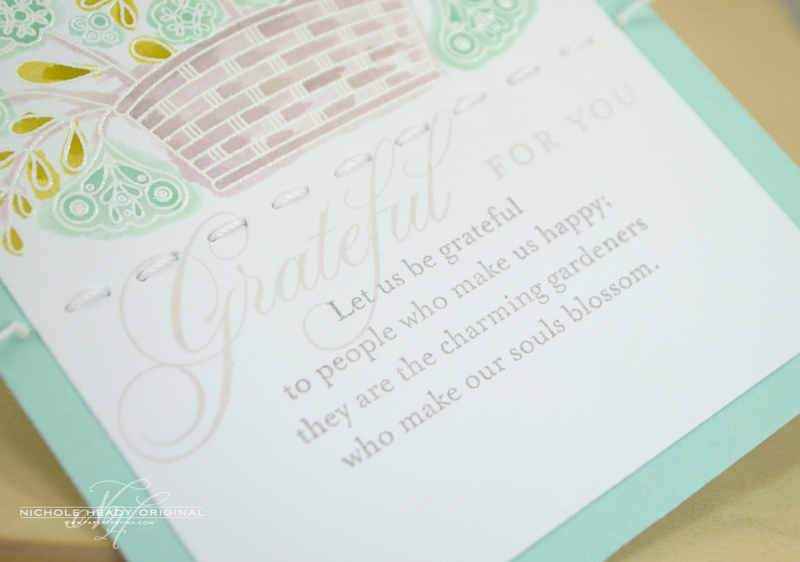 More great projects with the mums, and I’m in love with the font & sentiments in the basket set. I especially like the last mums card with the watercolor shadows. Beautiful projects today! I am intrigued by the Moracco Background Basics! Pair it with bright, vivid colors-I can’t wait! Love all of the colors used in these cards. You make it look so easy! Amazing projects today. I especially like the basket and mums. So many beautiful fall projects. Looking forward to the 15th! I think the Boutique Borders: Sympathy is really beautiful. I also like the font for the sentiments. Beautiful cards! Really like the burlap IP and the Morrocan BB set. Gorgeous projects!! How do you picked just one?? Love what you did with Mum’s the word. Oh, what a basket of blessings PTI has come up with for this release! Gorgeous projects. Oh wow! I love everything you are showing today! The mums are drop-dead gorgeous, and I love the folksy feel of the basket image. And the Moroccan background is just awesome, as are the Sympathy images. Love them! Your creations are simply stunning–so beautiful to look at and enjoy. Mum’s the Word and Rustic Burlap, I’m in heaven!! Awesome projects, Nicole. My favorite is the green mums card. Absolutely adorable. The new background builder is just gorgeous. I love Nichole’s choices of colors in her samples – they really make the stamps stand out!! Love them all!! I love the new BB Morocco! I just adore those two step backgrounds!!! I am loving the new impression plate – great for any project! I love the new font in the basket of blessings set! Thanks so much! Incredible projects here that make everything featured today go onto my wish list. I especially love that last card and the mum stamp set. Can’t wait for the release. Watercolored flowers are very beautiful! Love love love the impression plate burlap! Basket of blessings is soo beautiful. The new ip plate is on my wish list! Your cards are stunning! 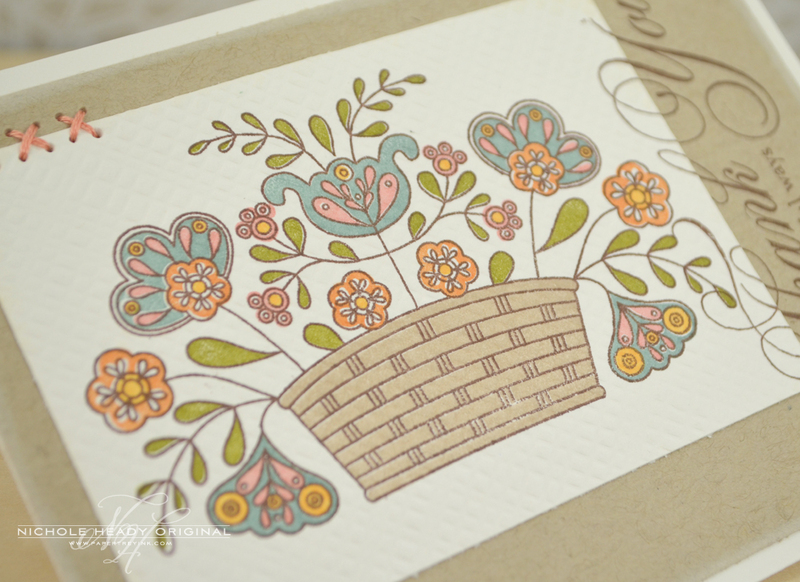 I love the background stamps and the mums…the whole release is wonderful! Everything looks lovely! You did it again! I think that BB: Morocco is simply gorgeous. And I love the sentiments in Basket of Blessings. The burlap IP is so autumnal. Can’t wait to dee the rest of the release. Beautiful cards! You are so talented. Wonderful thanksgiving sentiments. Beautiful! I love all things flowers and all things backgrounds. I can imagine all the fun ways to use the Moroccan set. 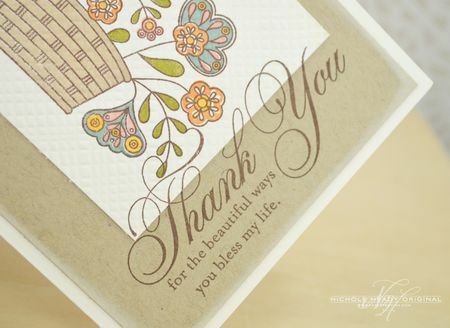 Love the sentiments in Basket of Blessings, & my fav is the “Thank You” card. The burlap texture is beautiful, the mums are pretty, & the Moroccan bkground is very striking. Looks like a great release! Those mums are calling me. Nichole, your versatile use of each set was an early autumn feast! Beautiful products and cards! The one with the perfect pearls is stunning! Wow Nichole your projects are top notch. Truly beautiful. Gorgeous projects as always,Nichole! Love the modern take on the Mums. 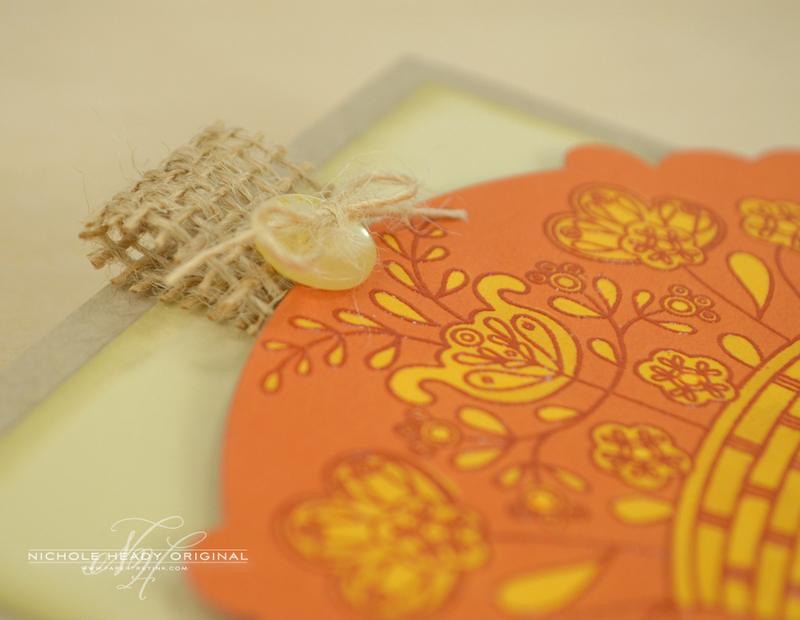 Love the Morrocan stamps, the burlap impression plate and Dawn’s Boutique Borders sympathy stamps. The new Sympathy set is just lovely. Also I love the mum set! Love the new sets. I agree these can work year round depending upon the colors chosen. All I can say is Beautiful !!!!! Love the inspiring fall samples! The detail in the Mum’s stamp set are beautiful! The basket of blessings is a beautiful addition to Thanksgiving greetings. The technique of using the same green to stamp the flowers and leaves over the printed words looks beautiful. I love all of the very different looks you got with one set of stamps. Truly Amazing. Love the ‘mums’. 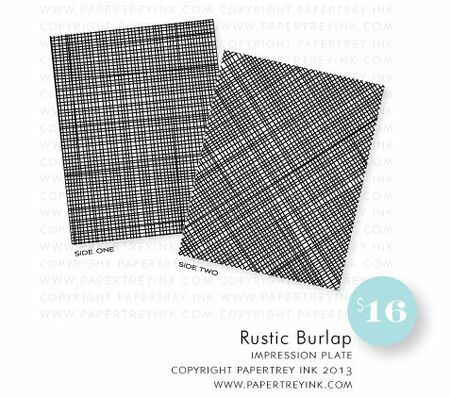 The rustic burlap impression plate will be a sure hit! Gorgeous cards! Love the new stamps sets and dies! The Basket of Blessings set is beautiful. It reminds me of my grandmother’s china pattern. Your products are the best and Nicole you add all the details that I would never think of. It makes the cards so special! Oh my! Mums the word looks amazing! endless color possiblities. love the burlap background too. Gorgeous projects, Nichole! I really like the Mum’s the Word stamp set…. off to check out what Dawn made with it today…. Wonderful projects!! Just love the Mum’s the Word set!! Have a great day! Texture and patterns are two things that I love so the burlap impression plate is looking very tempting as is the Moroccan background! Just gorgeous! 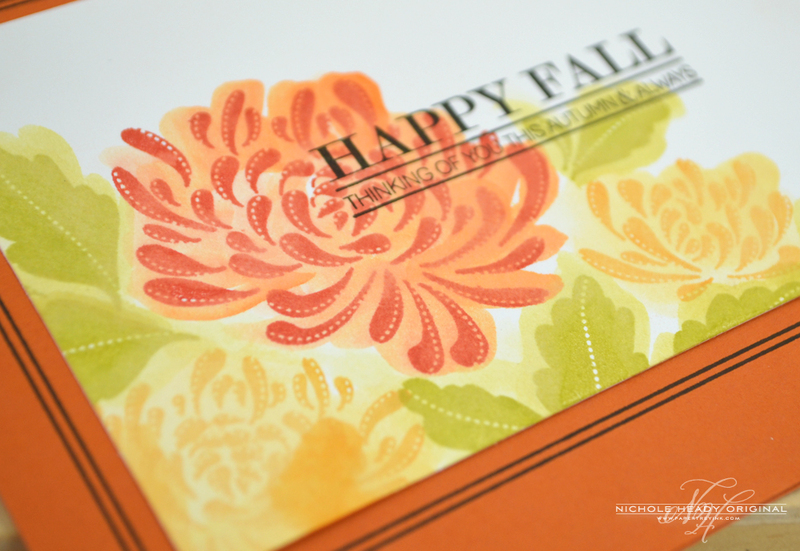 The Happy Fall is my favorite:Love the water coloring and the stamps are just beautiful! The Sympathy Boutique borders stamps and die will be a useful addition to my growing PTI collection but I think today’s “must have” is the gorgeous Mum’s the word stamp set and matching dies. I love your Mum cards – especially the green Sympathy one – so elegant! Counting down the days….what a surprise to have a new impression plate. I didn’t see that coming. Thanks for sharing. Cannot wait to see the full reveal. Today’s sets really lend themselves to some very elegant projects. Just beautiful. I’m very excited about the Rustic Burlap Impression Plate. The font choice for the Boutique Borders: Sympathy set is lovely. Thanks for all of the inspiration. Oh oh, that Mum’s the Word needs to come live with me and the sympathy set will be as well! Thanks for sharing your projects!! Oh dear, there goes the budget again! Loving everything you showed today. So many beautiful projects, just makes my crafty heart happy:-) Looking forward to the release. Love the Mums and With Sympathy. Simply gorgeous projects! These are fabulous stamps! Love how pretty the simple designs are! Your cards today are absolutely amazing. Can’t wait to get these stamp sets and give them a try. Mum’s the Word and the Morocco Background are my faves today – can’t wait to see more projects using these lovelies! I love the cards and projects. The PTI design team is the best! All of the little touches you include in your cards are what makes each creation truly amazing – from the delicate bits of fiber to the interesting techniques like bleach. The sentiments in both sets featured today are my favorite part of your projects; I’m looking forward to seeing more. Thank you. These sets are amazing!! So beautiful! Every one of them – in my cart. How gorgeous the Basket of Blessings set is, I cannot wait to see the rest of it! Love your sympathy card Nichole….Mum’s the word for me! Wonderful–I like the different looks you achieved with these products. These cards, stamps and dies are truly gorgeous! I have to say that mums are probably my favorite flower. I did these once for a cake I did for a wedding. I am certainly not a cake decorator but was asked to do it for a friend. I did the flowers in advance and they came out beautiful. I love the cards you have done today. They are absolutely gorgeous. The Mums look fabulous! Thanks for the inspiring projects. Ahhhh – yet another beautiful sneek peek! I really love your use of perfect pearls and the water coloring!! Mums really say Fall to me. Love the variety of colors they come in and can’t wait until this set comes to live with me so I can color them in Fall colors. Love the burlap impression plate. They are all so nice… hard to pick a favourite!! I love the basket of blessings and the mum set. Looking forward to release. There are some excellent things coming this month! You have made me so ready for fall! Love these projects today! The Moroccan background and those mum!!! Gorgeous! 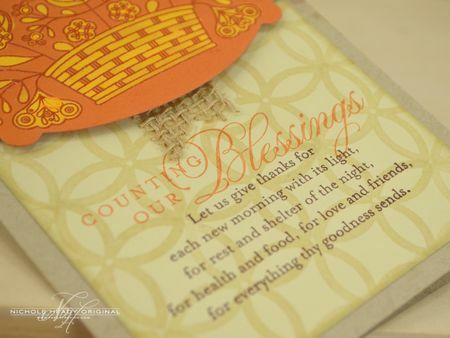 The new texture plate looks amazing, and the Basket of Blessings set has some terrific sentiments. I love Mum’s the Word and the new Morocco background set. Your projects are wonderful! Wow….. some amazing projects- especially love both of the sympathy cards! The mums are beautiful and the burlap IP is fantastic! I love this time of month! Cute fall sets are so fun. 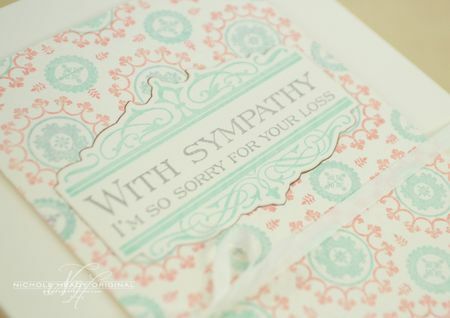 Love the sympathy border set. I am so giddy in love with those mums. They are a gorgeous set of stamps. And dies to match – yay. Thanks for the crafty appetizers!! Can’t wait until the 15th!! OH, so beautiful! Love everything, Nichole! What beautiful cards and I really like all of the different effects using watercolor, Copics or traditional stamping. I would love to have everything shown so far. What beautiful and inspiring examples! Love them and love all the releases you’ve shared for this month. Your preview left me wanting more. LOved the mums, the burlap plate and fall colors. Gorgeous! Looking forward to full release! Blessings, indeed! The BB Morocco looks like a fun set – think of all the patterned paper you could make! The sentiments are lovely. Look forward to seeing all the elements in each set. Another day of amazing creations by everyone. Great jobs. I am loving the burlap too! Love today’s post. Your basket cards are beautiful! Love the font in that set too. I especially love the Rustic Burlap Impression Plate. The design team has created some fabulous cards as usual. I love seeing how you have each used the new products! I love the variety of colors on all the samples today. Especially like the Thanksgiving card. Really liking today’s release Nichole! 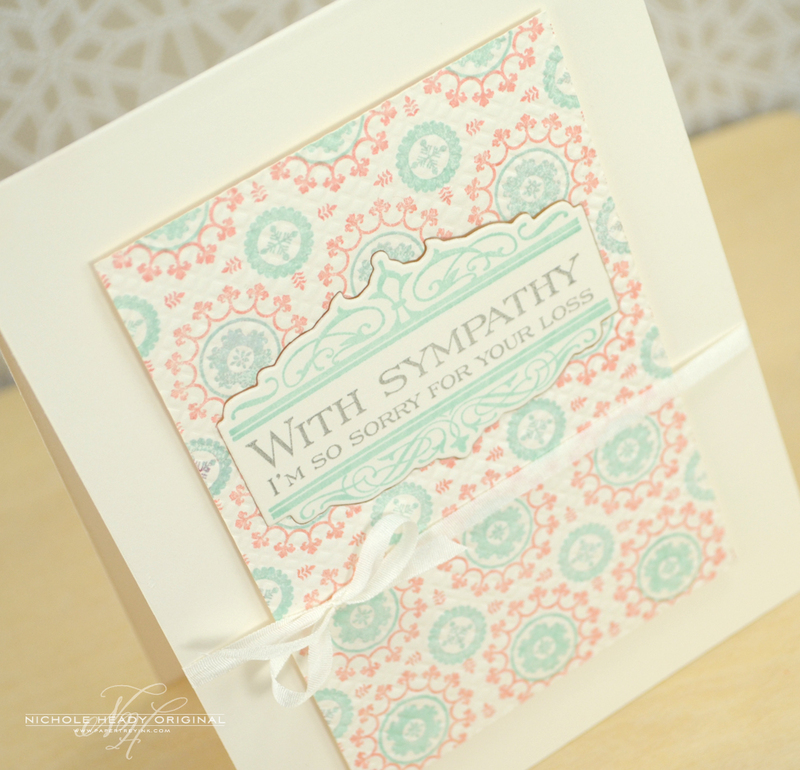 Dawn’s Sympathy Boutique Border is so pretty and perfect to use when those sad events arise. But I am absolultely in love with the Rustic Burlap Impression Plate! What a wonderful look for a card! Another great day of projects! I can’t wait for the 15th to order! cant wait to order!!! love it all!!! I’m loving ALL of this months previews! Can’t wait for Basket of Blessings and Mums the Word sets. Fall is my favorite season. I can’t wait to get stamping!! Loving all of the different looks that you can achieve with the Mums! Love the watercolor mum! The cute star barrette and all the other cute projects! TFS. Love the fall ideas! Love those mums! Wow! What beautiful projects today! I love the Basket of Blessings stamp set along with the Mums the Word set! Truth to tell, I love all the sets highlighted today along with the new Rustic Burlap impression plate. Can’t wait for the 15th!!!! Can’t say enough about Mums the Word! Love that set! Awesome release so far…can’t wait for the 15th! Wow these creations are absolutely Beautiful. They go way beyond my craft arena skills. I’m in such Awe! 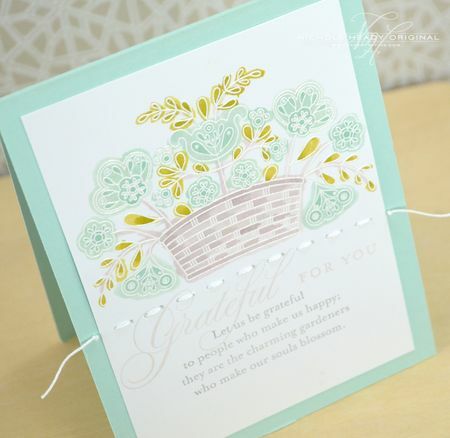 The Sympathy card you made with the mums is simply stunning, Nichole! Sympathy cards are never easy to make, so thank you for the beautiful sentiments and florals. Another day of amazing cards. Thank you. fabulous projects!!! I love them all! 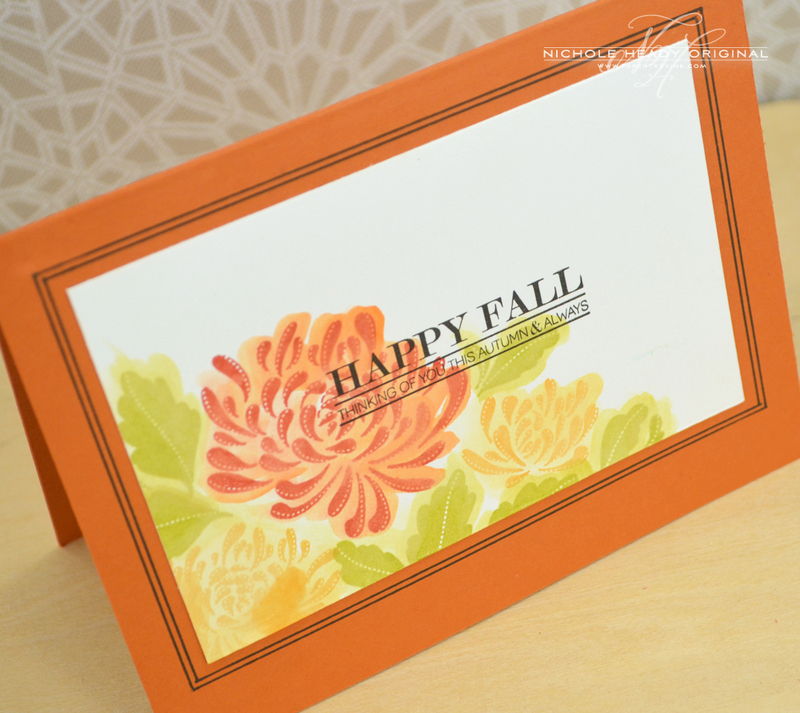 The Happy Fall card is beautiful! You have showcased each stamp set wonderfully. So many projects and ideas! That burlap impression plate looks divine! Beautiful cards! I like the Moroccan background. Lovely cards today and I am so excited about the burlap impression plate! I love everything about today’s release! From the gorgeous flowers, amazing sentiments and stunning patterns. Love the sample cards too. they showcade the new products so well. I’m so excited!! The flower style in the Basket set is one of my favorites. The Morrocan background is also going on my list. I really love the new sympathy set Nichole…so elegant and the perfect sentiments for a type of card no one likes to make. Wow that’s gorgeus… And I love the new impression plate!! Wow! The projects showcasing Basket of Blessings are simply stunning…. 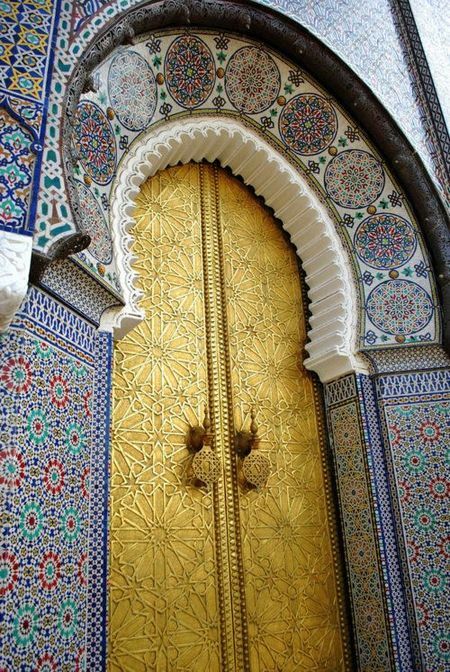 I love the bold designs, patterns and colors from Morocco, so I can’t wait to get my hands on the backgound basic! Gorgeous work. I especially love the sympathy card. Those mums on the last card are delicious!! Looking forward to the release! The mums are just gorgeous. Wow!! LOVE the burlap impression plate!!! The sentiments showed are so gorgeous and I cannot wait to order them. Love all your inspiration. Great examples. Ready to shop. Amazing projects!!!! The BB Moroccan and the Sympathy are my favorite. Beautiful cards! I love the basket with all the detail!! I love the variety in the sympathy set; it’s nice to have choices when it comes to making a card for a difficult time. All of today’s samples were awesome, I’ve got so much on my list! Absolutely beautiful! Can’t wait until the 15th! I swear, you create the most beautiful things as samples with the new products you are debuting. My favorite today is the new Background Basics; Morocco – it will be cool to make dozens of fun, pretty background designs! Over the top and another awesome month of releases!! No chance I can skip ordering on the 15th this time!! So many beautiful samples! Love the bleaching technique… I am going to have to try that! 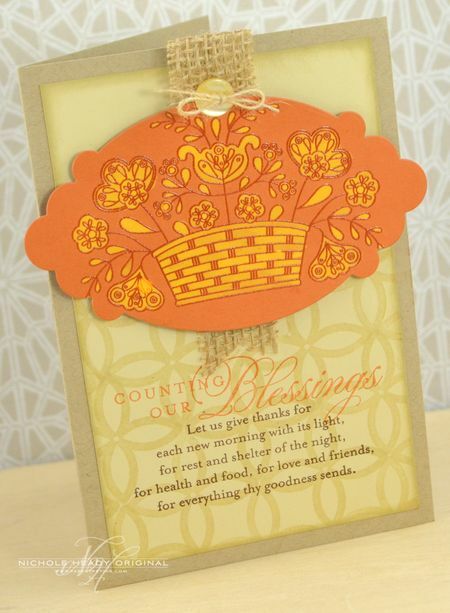 I just love the Mum die cuts and the Basket of Blessings has some great images for Thanksgiving. Looking forward to the new release. Beautiful stamp sets create beautiful cards! I love every one of the samples today. Way to go, ladies. Another great preview. I think that mum’s the word is my new favorite. OOOOO! I’ve been waiting for this one since the sneak peek. I think the flower in the “Mums the Word” is one of the prettiest images on the market and what a showing it made in all the projects. Thanks for sharing. Amazing projects today! Love the Basket of Blessings set! I love how you showed so many different ways of using it!! Love the mums & the new Morocco & sympathy set–big wishlist! Your watercoloring is gorgeous! I just love Dawn’s new floral set. Your projects are all so lovely. Beautiful projects today…such rich fall colors. I especially love your mums card with the perfect pearl background and your last card where you did a little watercolor I g with the mums. Love how it makes the flowers more full! Loving the basket. morrocan background and sympathy set. The mums are growing on me. Beautiful previews. Gorgeous samples! That sympathy card is so elegant. Simply beautiful! All of them beautiful! The sympathy card is simpy beautiful. What a classy card. Wow! I’m loving all the products introduced today! Can’t wait to start crafting for fall! Gorgeous cards! I’m a sucker for flowers and these sets are certainly no exception (especially those mums – fantastic!)! Beautiful projects today. My favorite is the Praying for You card. BB: Morocco is gorgeous and so are the flower sets. Such a great release! Love these new projects! Mum’s the Word is gorgeous! So much fun! I love the simplicity of the mums the word card in green, white, and black. Simple, but with a big impact. Love the watercolor technique as well for a completely different look. Lovely job to all the designers. Beautiful work. Beautiful cards! Love the mums & must have the basket blessings. Fall is my favorite season. TFS. Beautiful cards! The mums are gorgeous, they would look great In the rock and roll stamping technique too. Love all the awesome projects and can’t wait for Thursday! That Moroccan background makes me swoon. It is gorgeous! Basket of blessings is wonderful. This will be going on my “to get” list. Beautiful cards! I love the ones colored with the Copics. Beautiful projects, wow! I am going to have a hard time deciding what to order…decisions Thanks for the inspiration. Blown away by all the gorgeous projects today – WOW! Loving the Basket of Blessings and Mums the Word products. Can’t wait to have those in my stash! Beautiful projects today!!! Love the mums and dies! Beautiful cards. My favorite is the Thanksgiving card!! Absolutely stunning. Every single one of them is fantastic. Thanks so much for sharing! The Morrocan background is incredible. And, unfortunately, I make a lot of sympathy cards. That set is so lovely. Beautiful cards … The floral basket is a stunning image. The mums are gorgeous. 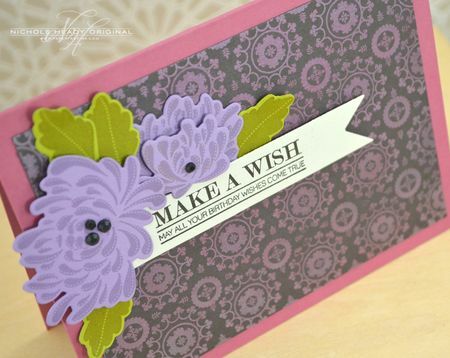 They’re one of my favorite flowers and make such beautiful cards in your examples! Love your sympathy medallion card. The moroccan background set is gorgeous and the sympathy set is a classic that I need. Love looking at your gorgeous samples, and wow are they giving me some ideas! Excited. Wonderful inspiration from the DT today! Excited for the release! Such beautiful cards Nichole, very inspiring. More on the wish list! Gorgeous cards, and such a variety of colours! Awesome release! The sympathy cards are beautiful! What amazing card samples today! Love the detail on the basket. I hope to see some more closeups on that impression plate – looks like something I’ll be adding to my wishlist for sure. I love those mums! The sentiments and quotes in the Basket of Blessings set are beautiful. I love Mum’s the Word, and the sentiments are just beautiful. Such sweet cards! I just love the basket of flowers! I like the border die! BEAUTIFUL cards and projects PTI team!! As usual I am LOVING it all!! HA HA!!! What gorgeous cards. 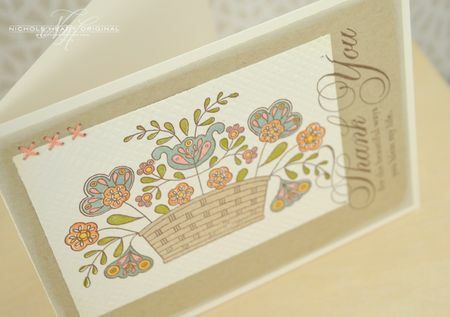 I especially love the watercolored Mums the word card at the end…so beautiful. 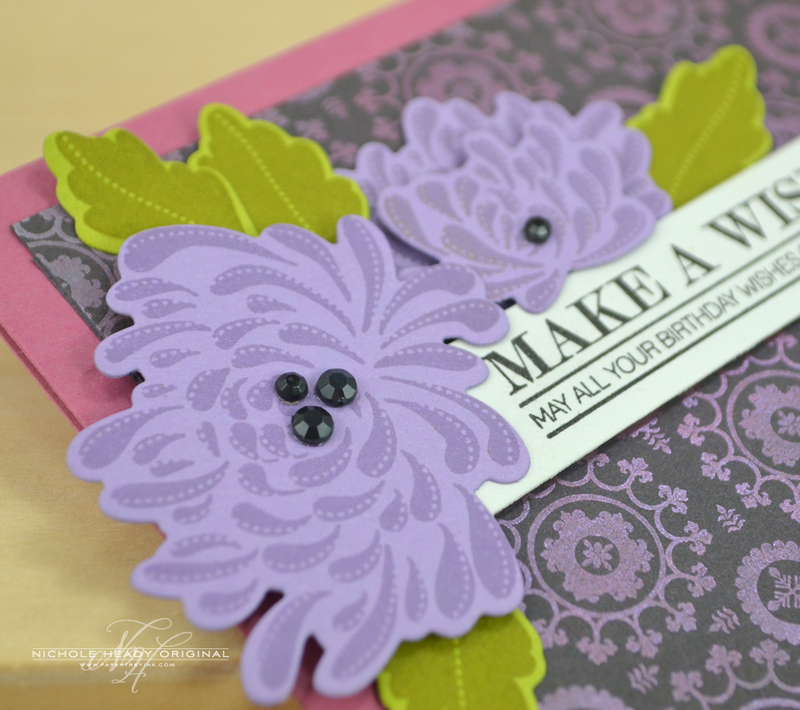 the MUM flower is gorgeous, I love what you made with that stamp! I love the burlap impression plate! I sure could have used this for my daughter’s wedding. Such pretty cards today! And I love all the different looks you achieved with Basket of Blessings! Have you done a video showing your Perfect Pearls technique? I have tried them and ended up making a complete mess. What is your technique? SO excited for Dawn’s new set Mum’s the word. I’m never ‘excited’ to make a sympathy card, but her BB: Sympathy looks like a such a pretty set. My favourite border to date – I love think up ways I could incorporate that pretty border into almost any project. Gorgeous projects today, as always ladies. You never let us down! Love the new boutique borders set! So pretty! Basket of Blessings is on my list just for those wonderful sentiments! Love the font! I don’t believe I have any gratitude type stamps. Basket of Blessings is one that I think I really need to add to my collection. I love the background basics: Morocco. Order day can’t come soon enough! Oh my, I am real trouble now! Everything so far is gorgeous! I love the “Mum’s the Word” set. Can’t wait to see tomorrows release. Absolutely beautiful projects today! 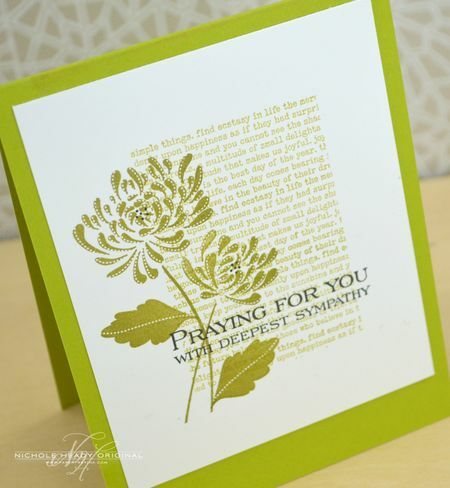 Love Nichole’s green monochromatic sympathy card using Mum’s the Word and BB:Sympathy. 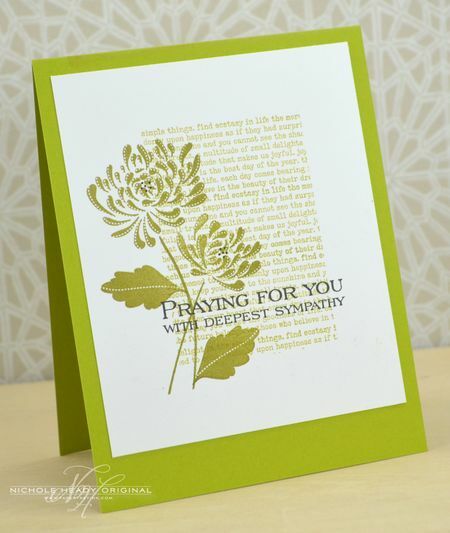 Dawn’s neutral sympathy card using repeating patterns of the BB:Sympathy scroll is stunning. Great inspiration today, thanks! Burlap is hot and so is the new impression plate. All of the projects are gorgeous! Basket of blessings is beautiful. I love the sentiments and the fonts. Fantastic cards today. O.M.G!!!!! My heart, be still!!! I’m IN LOVE with the new collection! Oh, my wish list had just grew up a mile… Thank you for the new ideas, inspiration and wonderful stamps & dies!!! All are great samples and great stamps, but Mum’s the Word is my favorite. I don’t really NEED any more flower stamps, but am absolutely loving the Mums the Word set! It is just gorgeous with any color combo, not just fall themes. Thanks for the chance to win a great gift certificate! Gorgeous cards! I love that Papertrey has matching dies with so many of their stamps. I love the swipes of colors you added to the flowers in your last card! Gorgeous! Absolutely stunning new products, Nichole! 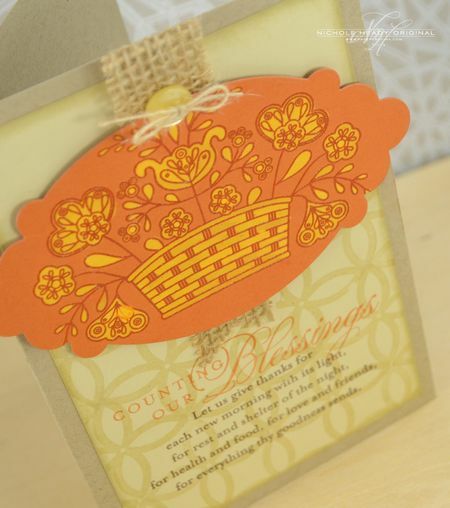 I love, love the basket in Basket of Blessings, and the Rustic Burlap Impression Plate is a must have! Thank you and the DT so much for sharing your projects with us! Such beautiful cards! Lovely sentiments and flowers! I like it when you include solid stamps for coloring an image so Basket of Blessings is definitely on my list. I really like the Morocco card and how you used it with your perfect pearls. Perfect! Looking all the beauties you created makes me want to have all of the new release. Fabulous job! Beautiful cards and sneaks. Cannot wait for the release. Wonderful stamp designs & beautiful samples today showcasing them! 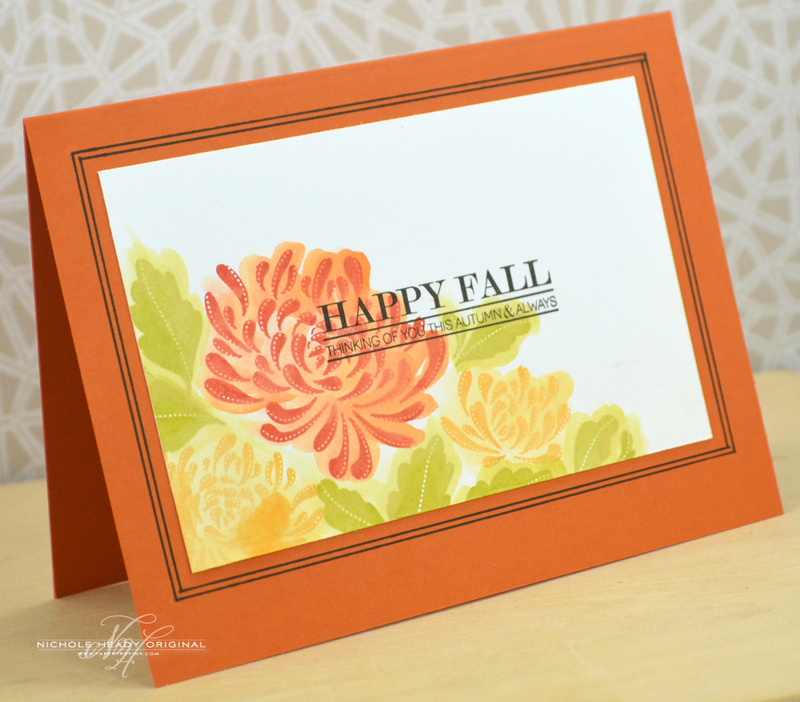 I’m so looking forward to making fall cards! The examples today are outstanding and so beautiful. I really enjoy (& benefit) from seeing so many different looks using the same item. Absolutely LOVE the basket of blooms! Your projects are so beautiful. All the fall projects are gorgeous! Everything is looking gorgeous again. Can’t wait for the complete reveal. The flower basket and Mums sets will make gorgeous Thanksgiving cards. Today’s cards were beautiful. As usual, I love all the florals. I’m so excited that you used bleach technique on one of the cards as well – one of my favorite “tricks”!!! OMGoodness! Basket of Blessings and Mum’s the Word are must haves!! I just love the images and the sentiments. Am loving the Basket of Blessings … such beautiful projects! Beautiful images and dies. The Rustic Burlap impression plate is fabulous. Also love the Mums. Pretty samples again. Wow!! These are beautiful images and the projects are stellar that go with them!!! Beautiful cards! love the mums! Love the Background Basics Morocco and I am so excited by the Rustic Burlap impression plate! What fabulous new stamps!! Love the background set. And the mums are awesome! Love the mums. Flowers are always so versatile. Awesome cards! How lucky are we that we have Dawn designing for the team! You two are quite a combo! The range of looks using Basket of Blessings is quite impressive. Can’t wait for the release! Wow. I am always so amazed by the versatility you can get from these sets — such different looks. The mums are beautiful, liked the Moroccan background stamp. Love the basket and mums. Beautiful cards as always. Especially loving the sentiments from these sets. What a great release, love the mums! Love your “Praying for You” card – so simple & beautiful. Sympathy cards are the hardest for me, but this one is just perfect. Oh my! The basket of blessings is sooo beautiful!!!!!!!!! Wow, you’ve been busy! A lot of amazing projects. I especially loved the medallions done in Perfect Pearls. Gorgeous. Beautiful pojects!!! Boutique Borders Sympathy is going to be high on my list as we age we need more and more of these sayings. Such stunning cards made with this set!!!! I love all the different ways you used Basket of Blessings! Oh my gosh! Your projects are stunning! Especially the Sympathy cards and the Fall card! I absolutely love everything, again. So much inspiration from you and all the DT this month. Now, to have an endless supply of money so I can get it all without guilt. LOL! I am totally amazed at how each month the releases continue to get better and better. Well done Ladies! These are all lovely! Loving that Basket of Blessings! Really loving the Boutique Borders sets. The Background Basics: Morocco is really wonderful too. So many great new sets and dies to choose from this month as always. The card samples are beautiful! “Mums the word” is beautiful! I love seeing the fall colors coming out! I love Mums. Beautiful cards! I really want to try the white embossing with watercoloring! Such a lovely soft look! Thanks so much for sharing all these beautiful projects! I should really go and get to some crafting! I love the new sets as always nice designs and great projects. Oh that sympathy card is so lovely and just my CAS style! Love BB:Morocco! And your card where you water colored the mums is stunning! All stunning gorgeous color combo’s too! All today’s products are so creative… don’t make me pick! I love the variety of techniques used, so inspiring. Thanks! Beautiful projects today! Loving the new background stamps! What beautiful sentiments and cards. This is shaping up to be a wonderful release! The sentiments from Basket of Blessings are lovely. If I could combine those with the mum images, it would be in my cart in a flash. Gorgeous projects today! Love the Background Basics: Morocco set! Wow the burlap impression plate is gorgeous! I am loving all the fall images and colors! The Basket of Blessings is tops on my list! I can’t wait to get started on my Thanksgiving cards, thanks for the inspiration! Amazing color combinations and artistic designs once again. Mum’s the word looks like another fabulous floral stamp set, and I definitely need Boutique Borders: Sympathy. Looking forward to the full release! The Morrocan set is gorgeous! I can’t wait to get my hands on it. Thanks for all of the fabulous inspiration! Mums the Word is so beautiful! I thought I had enough florals, but this one I need to add to my collection. love, love, love the new mum set… absolutely gorgeous!! fabulous projects today! Always beautiful!! 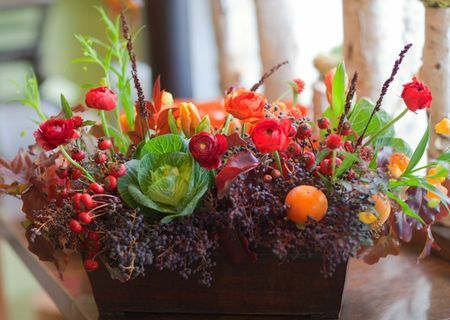 Thanksgiving rustic apples fall flowers what’s not to love. I thought I had enough flowers, however that Mum set is calling my name. Such beautiful designs today. Love the new Impression Plates and Morrocan background. Dawn’s new Mum stamp is lovely! Beautiful projects. Look forward to seeing more of Mums the Word. My favorite sets so for this month! Great projects today. Love the burlap impression plates. They are a must. Oh, the Mums and the basket are so pretty! Stunning projects! The mums look gorgeous in every color! Love the praying for you card. It’s soft and elegant. So beautiful and so very versatile – just change the colors! Wow I see the great potential of today’s peek!! Love love love Dawn’s flower sets, and this one is no exception! I’m so excited to see what the ladies have come up with for sample projects!!! Oh my goodness, the projects are all so BEAUTIFUL today! Love it all!! sympathy cards are never fun to make, however they are necessary sometimes. the mums and the sympathy stamp set are amazing. thanks. The mums are gorgeous and the impression plate is really calling my name! I just love the texture you can add with a simple tool like that. Love the mum and especially the sympathy card. Oh – I so can’t wait to get my hands on the Rustic Burlap IP!!! LOVE!!! Everything is just fabulous today! I love it all, which is not good when it comes to decision making later. Beautiful projects too of course! Such a talented group of designers; I love what you created. Beautiful projects today. In love with rustic burlap and the folk art basket. The mums look so beautiful! Boutique Borders Sympathy will be used quit a bit. It is so eloquent looking and feels like just right. Gorgeous cards! I am loving the Moroccan backgrounds. Beautiful cards. The purple Make a Wish really got me today! I’m sooo in love with this release! oving the new background basics and Mums the word – stunning. I love my PTI impression plates & Rustic Burlap looks like another winner! So much inspiration shown today, all of the projects are just lovely! Mums the word stamp is beautiful. I can’t wait to use it. Wow…These are amazing. I love the Mums the Words stamps and dies, and the Moroccan background. Fantastic samples. 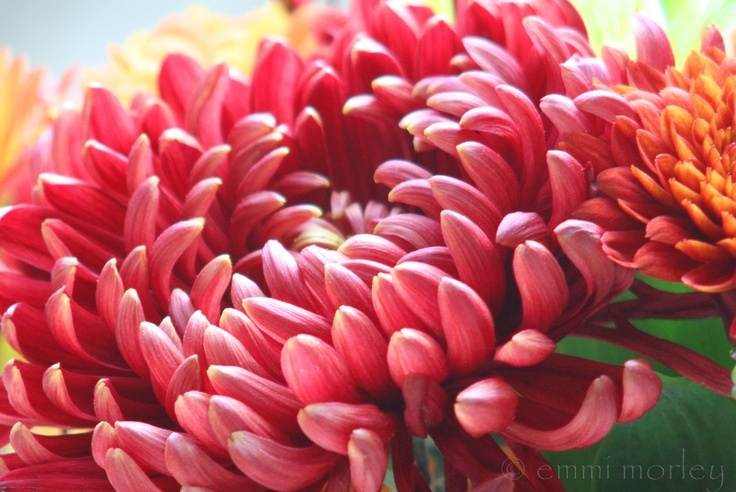 The mum are just lovely, with or without the dies – so pretty! The Basket of Blessings and Mums the Word are awesome! Your cards are so beautiful! Thanks for sharing and for all the wonderful ideas. Love the Morrocan prints. I’m not quite ready for summer to end, but today’s posts have made me look forward to fall. Your cards are so beautiful. I love the new stamps and dies. Gorgeous doesn’t even begin to the adjectives used for your card samples, Nicole. I am always so totally in awe of your beautiful designs and color combinations! Love Dawn’s new sets and can’t wait for the full reveal of everything this month! I am in love with the Mums! Such a pretty display of cards today!! Love the simple green mums with the text background. A simple card that packs a punch! Beautiful cards! The stamp set and dies featured here are wonderful! Gorgeous color combinations and I agree that the Moroccan background is great!! Love the Count Your Blessings set! Can’t wait to order. Such beautiful projects! Thanks for the opportunity! Wow, I am absolutely blown away by the Moroccan pearls card, and the watercolor of Mum’s the Word. Beautiful! The projects are all lovely – and such beautiful colors! They’ll be perfect for many occasions. Beautiful projects today, love the Moroccan backgrounds! I have been loving the “Mum’s the Word” set as Dawn has been previewing it. Today’s cards confirm that I will need it in my collection. Thanks for the creativity and inspiration. LOVE the mums! Dawn creates the best floral sets!! Wow. I am loving all the sets from today. Just beautiful. 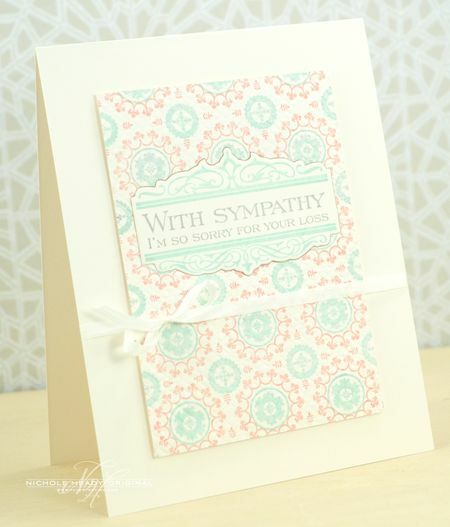 The sympathy set will be a great addition to my collection, and the flowers and morrocan background are just lovely! Beautiful projects! How do you do it every month Papertrey? Love everything! What absolutely gorgeous cards!!! I love all of the sets, but the BB:Morroccan is my fave! Everything is beautiful! I really love the Mums!!! Love the Praying for you card today. Since I’m not a Halloween person I really thought this was going to be an easy month – boy, am I wrong. Your posts are just blowing me away. And to think, there is more to come!! Love the Mum’s! Absolutely beautiful projects! That impression plate (burlap) sounds so very useful. I can imagine using that a lot! Mums are one of my favorite flowers! I have several of them in my flower garden area. The sentiments are all really pretty!! Super gorgeous! Loooove the flowers and the new impression plate. How pretty!! What great sets! All of the cards are lovely. I love the sympathy sentiment….it is perfect! Wow-so many different looks with the basket & mumm set just by using different inks. These would be good sets to have. As always, I do NOT need another floral set…..BUT that Dawn gets me every time. I love, love, love Mum’s the Word!!!! One can never have too many flower stamps. The Basket is so pretty and you showed every way possible to use it. The new impression plate looks great too. Burlap is so in right now. I am in love with the new Impression Plate. I love the mums, perfect for sympathy cards!! More gorgeous projects – love the texture of the burlap impression plate! Love the samples. I really love the new Morocco background basics set. The mum set looks like it will be fun also. Hmmm… those burlap impression plates would be a nice addition to my wedding invitations. Love the Thanksgiving cards. Can’t wait to see the rest! Love all the projects shown today. As always, just amazing work. Fabulous work, the moroccan background is a must have item!!!! Mum’s the Word is top’s for me…. Sympathy cards are always a challenge. Thanks for the inspiration! Boutique Borders: Sympathy looks like a great set. Beautiful inspiration today! I especially love Lizzie’s new impression plate and Dawn’s mums. Autumn is just around the corner! I love the Mum set and the sentiments are wonderful. I recently ordered some of the stone paper for the first time and can’t wait to receive it and try it out. That new Mum set is so lovely! I am always a sucker for botanicals! Lovely way to layer ink colours as well. Awesome! I love every single card, but especially the Praying for you card with the simple one-color mum. I am continually drawn to the simpler designs. They just speak to me. Gorgeous cards today!!! Can’t wait to see more!!! Great ideas. The Mums are lovely. I am SOOOOO… in love with that scripty font! Gorgeous!!!!!!! Those mums have me swooning too! The Morocco background stamps look so pretty and I love the Rustic Burlap IP, this will definitely be a staple in my craft room. These cards are just beautiful. The Morocco set is so versatile. I love the backgrounds you created. They are really lovely. Another great addition to the Boutique Borders series. All of these are must haves! As usual, all the new releases are great. Its always hard to pick a favorite! The Moroccan backround set is just beautiful! Great inspiration today. Really looking forward to the new burlap impression plate! Love all the inspirations! Thank you for the chance to win. Keep um’ coming PTI, I love the mums! OMGosh! Those baskets are beautiful and the Happy Fall card is stunning!! Thanks for the opportunity to win. Thanks for shaaaring all your great ideas and cards. Can’t wait to order the mum set. OMGoodness!! I love everything!! The samples are stunning!! Baskets & Mums! Simply gorgeous! You’ve been reading my thoughts – again! LOL! Projects are spectacular, too! Love these! I love the thanksgiving set especially the font of the sentiments! Wow, the new morocco background set is beautiful. Also love the new mums the word set…perfect for fall cards. Aug. 15….simply wonderful! Thanks for the inspiration. So excited for mum’s the word and the burlap impression plate! I am in looove with the last card! I need to try that color scheme. Thanks so much for more great sneak peeks and inspiration! Beautiful artwork! Love the sentiments in the large print! I love the mums, can’t get enough of your flower stamps and dies. The cards were all spectacular. Another beautiful release, can’t wait. Tough to pick a chart topper but the Rustic Burlap is my favorite….the possibilities are endless! Love your bleaching technique, something I plan to try today! Gorgeous, gorgeous gorgeous new stamps! I am especially enamored with Dawn’s new dahlia set. Gorgeous projects! I love the new texture plate and all the new stamps! I love the mums and the Moroccan background! For sure must haves from this release! I can’t decide which I love more, the rustic burlap impression plate, or the background basics Morocco set! Both are absolutely amazing! As if I need any more florals, but I am loving Dawn’s mum set…I am going to have so much trouble deciding what to get this month. I love this border and its sentiments. It’s hard to get the perfect sympathy sentiments. They have to be just right. Mum’s The Word looks gorgeous! Love the Rustic Burlap Impression Plate! More great inspiration, as always! Love the burlap look and the mums! Love everything so far. Your watercolor card is gorgeous! Love this release, especially the Basket of Blessings. It can be difficult to find great verses for Thanksgiving Cards but these seem to be perfect! Looking forward to the burlap impression plates, too. Love Mum’s the Word! Beautiful projects! Love the bleached basket card and the praying for you card…great techniques I’d love to duplicate! Gorgeous products and projects! Love the burlap impression plate and Mum’s the Word! Great cards today. It is looking like a fun release..
Beautiful sets and cards. I LOVE the floss stitching on the vertical card. It adds so much to the card. I need to remember to get out my floss! I really love the baskets of blessings stamp set, curious to see which dies with work with them! Great cards ladies! Lovely projects. I especially like the Text Style/Mum card..so simple, yet so elegant! I absolutely love the burlap impression plate. Great preview! This is going to be one expensive 15th for me! Knew without a doubt Mums the Word would be coming home to me. What I didn’t realize was that Basket of Blessings would be making it’s way as well. :o) Love the font for the larger words along with the sentiments. Have so enjoyed this release and all the wonderful inspiration by you and the DT. And, we still have 2 more days….oy vey. I love all things burlap! Always love seeing more Boutique Borders and I think I’m really going to like the Burlap Impression Plate. Dawn’s new Mum’s the Word stamp and die set I think will be really fun to work with. Liking everything I’ve seen so far. Loved all the awesome ideas and products today! Gorgeous projects! Love everything I’ve seen so far…. LOVE the cards! The new impression plate is a must have! Love all of these samples and new sets – makes me look forward to Fall! Loving the fall colors and projects! Just beautiful! Love your projects and the burlap IP! I especially like the “praying for you” sentiment and the card with the mums. So beautiful! Gorgeous cards, loving the new sets this month! The Moroccan background is gorgeous and I love that the basket of blessings can colored in with so many different mediums and be for so many different occasions. The design team is such an inspiration! I love the Basket of Blessings and Mum’s the Word. Your never fail to impress me with your color sense and design talents. Every one of these cards is lovely. Rustic Burlap L.O.V.E. The Moroccan background is just gorgeous!!!! Ok… I am in love with that basket of flowers! Really … it is gorgeous!!! Can’t wait! Beautiful mums and that background is gorgeous! I’m overwhelmed by all of the great ideas! I love the folk art look. It’s always amazing how much those tiny touches you add to a card creation just finishes off each card. A bit of thread, an edging of white, a bit of water coloring. I really need to remember this. Mums are one of my favorite flowers so this set will be perfect. I’m with Dawn, I just love fall mums. Her new Mum’s the Word is awesome! Lots more great stuff. Love Dawn’s Mum’s set- such a beautiful design. Thanks for sharing. Love the mod twist to the mums. This is going to be a go-to floral for me! Can’t wait until the 15th. The mums are drawing me in! Wow these are amazing. I love the basket!! Very excited about today’s sets. Nichole, your cards are stunning. Can’t wait to check out the rest of the DT. Your inspiration is just jaw-dropping!! I really, really love Basket of Blessing and the Morocco background. Simply stunning! Wow! What versatile sets! The possibilities seem endless! Beautiful cards. The sympathy cards really touch my heart. Another day of stunning peeks…love the soft fall colors, just so beautiful. Love, love the new flowers, just fabulous. Oh my LOVE the flower basket! All your beautiful cards want me to buy copics & every set!! Love the mum cards! And I’m so happy that set is only $15! Mum’s the Word is yet another must have! And I agree with what others have said, you can never have too many flower sets!! Just when I thought I didn’t need another flower set, Dawn comes up with Mums! Absolutely a must! Oh very nice. Thank you for offering new options for sympathy cards. Unfortunately we all need them from time to time. Wow! Amazing flowers! So versatile. Love it! All fabulous, but I’m especially loving the second to the last with the tone on tone – so beautiful! Dawn’s new Mum set is absolutely gorgeous! I just loved the projects from today..What a great job Nicole. I can’t wait to see the rest of this Months reveals. Just love the Morrocan background, and the flowers are awesome! Love the new Moroccan inspired background set. My sister is getting married and we’ll be making the invites, that looks like the perfect backdrop! These are beautiful & I so appreciate how you use the same set in a variety of colors and occasions so that we can see the versatility of using them. The new Morocco background looks amazing! I am a sucker for flowers and so I know that Mum’s the Word will become a favorite set of mine! Loving the new burlap impression plate and the mums stamp images. Beautiful projects and I really love the basket! Your projects are so beautiful. I am in love with the Moroccan background. Love the new impression plate & the mum dies & of course, all the beautiful project samples. You’ve done it again PTI…make me want everything!! Lovely cards, exciting previews of this months release. Even though we don’t “do” halloween and thanksgiving here in Australia, I can see that the lovely components of these previewed sets, particularly some of the sentiments, have a much wider application. Roll on the fifteenth I say! The Mums set is beautiful! Mums and Fall sure make a great pairing! All beautiful cards! Wow…The flowers and the borders rock. These are the best that I have seen in a while. Your colors ROCK too! The Rustic Impression plate looks very interesting. Thanks so much for sharing with us! Lynn G.
Background Basics: Morocco is sure to be my new favorite! Loving the Autumn florals! 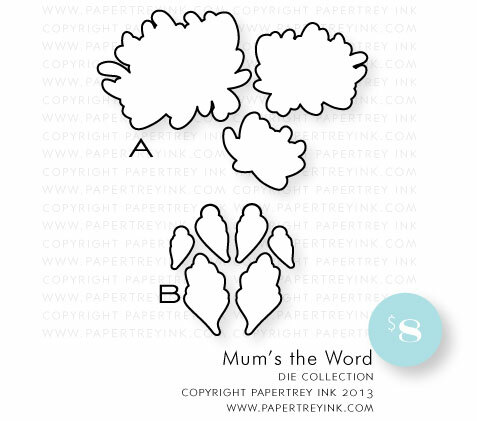 Mums the Word especially, which is unlike any of the other floral sets in my PTI collection! Makes me almost ready to embrace the fall season…almost, but not quite! Beautiful projects today! This release just keeps getting better and better. I learn so much from you about color combinations. For example, on the sympathy card, you used both Simply Chartreuse & Ripe Avocado. It makes so much sense for you to have chosen these colors, but I would never have thought of it! I would have used a neutral color for the background & it wouldn’t have nearly the cohesive look yours’ does! Gorgeous cards and the new sets are wonderful! Absolutely gorgeous creations! Can’t wait for the 15th to see it all and figure out what I want to order during Stamp-A-Faire! Love Dawn’s Mum’s the Word, and the Rustic Burlap impression plate. I love both the Basket of Blessing and Morrocco border! Love the new rustic burlap texture plate! love the patterns on the new impression plate….haven’t had a chance to use these yet so looks like this will be the month to try them out! Love those Mum’s!! Perfect choice for fall cards- I just adore the terracotta card! So so pretty!! So excited for this release! Fun fall projects! I love the basket with those wonderful flowers! Very pretty cards! Wonderful samples as always! Love the basket – amazing how different colorings change the look. Lovely projects! I’m especially liking the “happy fall” sentiment. My favorite season!! I really like that boutique border. Wow, i love all of your cards! Those background and mums are absolutely fabulous! Mum’s the Word is great! I can never have enough flower stamps and Mum’s the Word would be a great edition. I love the burlap impression plate! I really like the background set and the card samples are excellent. I like the monochrome card a lot! Thanks! Beautiful projects! Am loving this release! Wow, what beautiful products! I’m loving the Moroccan background, Mums the Word, and the new impression plate! Can’t wait to see the full Moroccan set!! oh my word…i love the looks of the new rustic burlap impression plate! GORGEOUS projects! I can’t wait for the full reveal!!! Beautiful cards. I’m so excited to see what else you have up your sleeves. The Moroccan backgrounds are simply amazing!!! Love the new burlap plate and the mums. Great cards and inspiration. Just love the MUMS and the new Sympathy Set. They are beautiful! Wow, what gorgeous work today Nichole, impossible to pick one over the other. Wonderful colours from rich to subtle, beautiful. Simply amazing projects!!! Love those mums!!! Ohhhh….the Moroccan backgrounds are awesome and those mums are simply beautiful! You all never cease to amaze me with all of your beautiful projects! Again and again the PTI team comes up with spectacular ideas!! The Basket of Blessings is just perfect! Thank you! 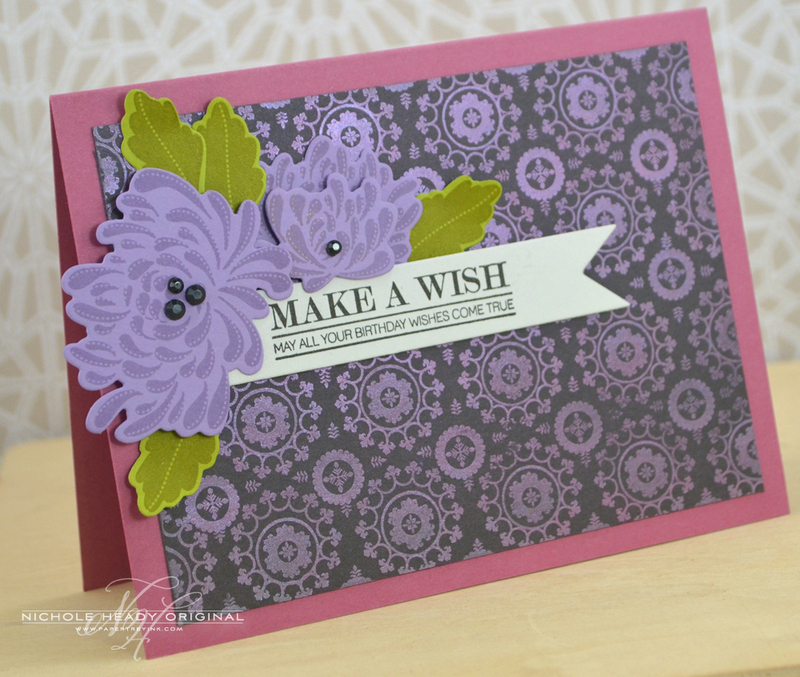 Beautiful projects, so by the new stamp sets and dies! LOVE ‘Mums The Word’ set. Love the fall colors and the Basket of Blessings! Beautiful projects today! Excited about the burlap IP! I absolutely LOVE the “Mums the Word” stamp set and dies! I am looking forward to using this set this fall and making beautiful cards in all the fall colors. Today’s projects were so fun and inspiring! Beautiful projects! The mum set really lovely! 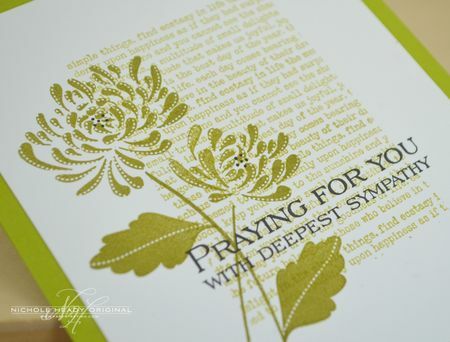 Love the sympathy/praying for you card in chartreuse. Wow!!!!! These sets are amazing! I knew I was going to love the mums from the peek and the morocco background is gorgeous!!! The burlap impression plate is perfect for fall projects. Loving this months release….all the new dies are fabulous and I’m loving the Rustic Burlap Impression Plate! Thanks for the chance to win! I love the shapes of the mums themselves. What a fabulous set! I also am interested in the Sympathy set, I have been needing quite a few lately, and never quite satisfied with what I have. Beautiful, love the deeper bottom border you have left ton a couple of your cards! Love all the cards. I will have to make them all!! I love the projects! I especially love “Mums the word” and the new Boutique Borders: Sympathy. The new sets remind me of how much I love fall. The mums are beautiful. 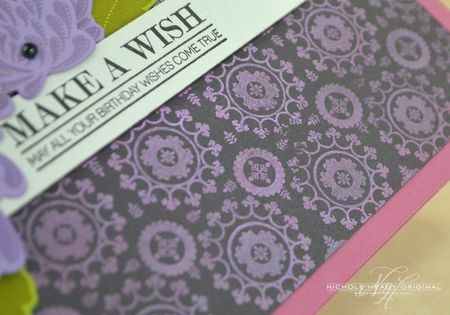 I love Papertrey’s two step background stamps and Morocco looks like a great addition to that collection!! Loving the basket of blessings set! Love how you get a different feel from the basket image depending what color scheme you are using. That mum’s the word is so fun! Love the Burlap impressions plate. I currently do not have an impression plate in my stash. THat may have to change. My favorite from today is definitely the fall card. Gorgeous colors, love the watercolor effect on this card and I’m loving the sayings on the Mum’s the Word set too!! The Mum’s the Word set is beautiful. Am also loving the burlap impression plate. Gorgeous projects today! Beautiful cards. 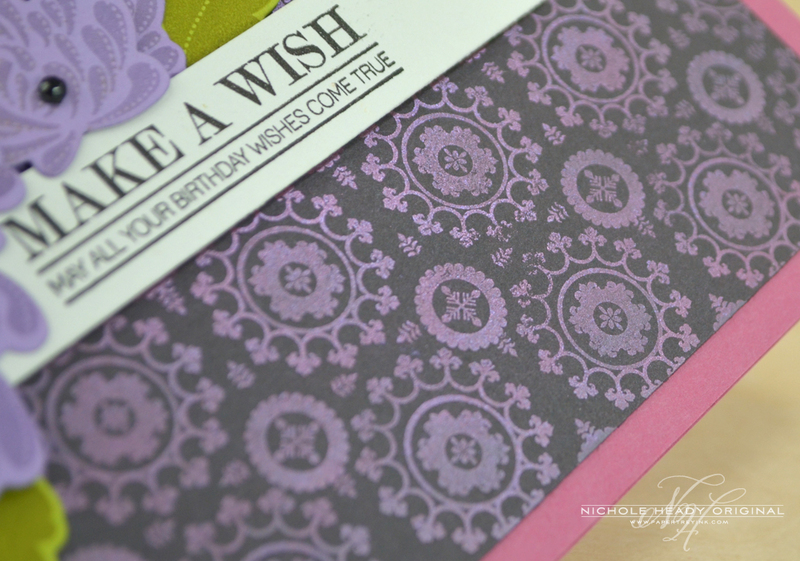 Love the one stamped with the Marrocan background with the boutique border die. Your watercolor card is gorgeous. Just gorgeous!! Love those sentiments too! Beautiful cards! The Thanksgiving and Fall cards are my favorites. Oh my…everything is so beautiful. I’m in love with those mums. They will be mine for sure! I am in love with Background Basics: Morocco set! Your Make a Wish card is absolutely gorgeous. LOVE the Marrocan background! Mums the word looks great to too! Loving all the projects shared! Mums the word is on my list of must haves! Love the Morocco background and the burlap impression plates. Lovely projects too! 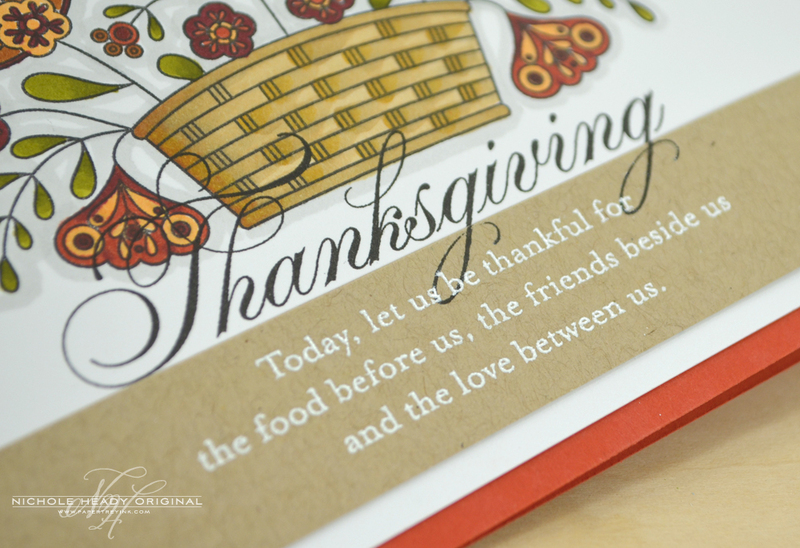 I love the burlap texture plate and am absolutely in LOVE with the font of the ‘thanksgiving’ and ‘thank you’!!!!!! I’m an absolute sucker for fonts and different combinations of fonts – something that Papertrey does so amazingly and most other stamp companies seem to put off as not as important! The right font makes a card in my opinion!!!!!!!! Love it! I love the burlap plate, very cool. Great job on all the cards ladies, you all just amaze me. So many great products this week. I am especially in love with Mum’s the Word, though. Can’t wait to use these stamps in my autumn projects. 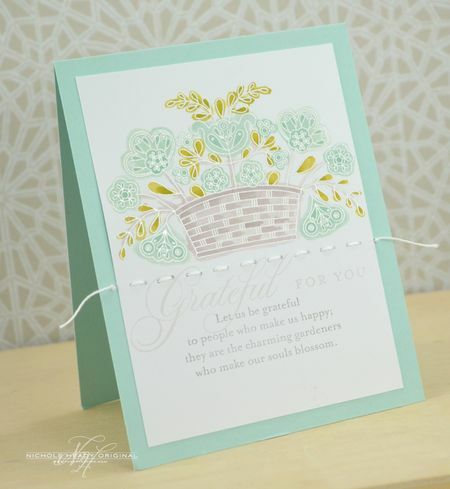 Really liked the Praying for You card….simple and elegant. Love the mums and the burlap impression plate. Great cards and inspiration! I suggested a Moroccan inspired set back in 2011 and am so glad it is finally coming out!! Thank you so much! loving Mum’s the Word! Very lovely! Thanks for the chance to win! The DT samples make me want everything! 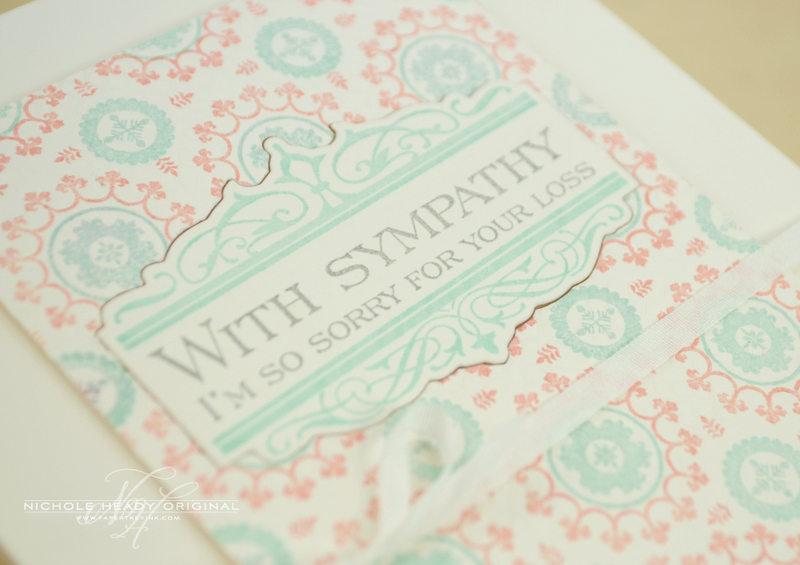 Not that I want to make any sympathy cards, but I am really liking the style of Boutique Borders Sympathy. Thanks for another great day of previews! Beautiful projects today! Love the Morocco background! Love the new Mums set and our monochromr card is just beautiful! 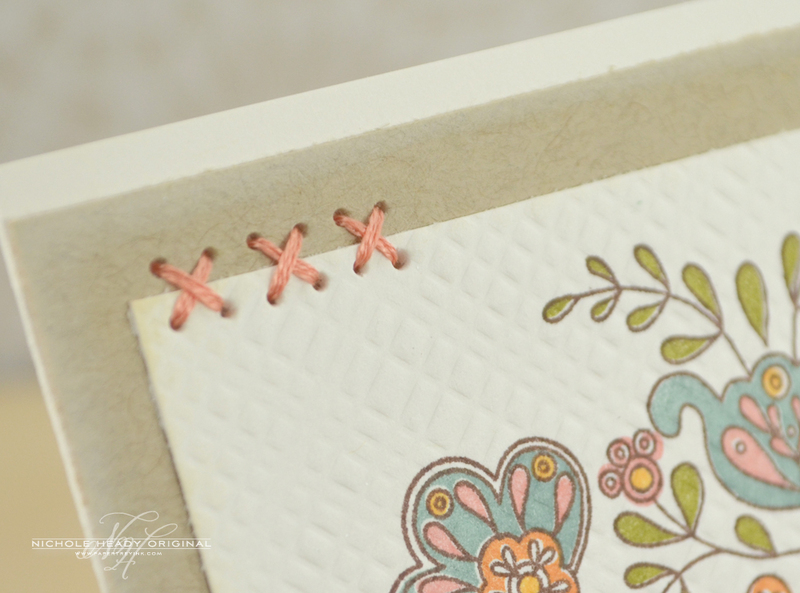 I love Dawn’s new floral stamp set & the new impression plate looks like a “must buy”! I’m a sucker for flowers and the Mums set is beautiful! Excited about the burlap impression plate. I wasn’t sure about the Morocco background set until I saw your card with the Perfect Pearls. It’s beautiful and has convinced me that I do want the stamp set after all. But my favorite product today is the Mum’s the Word stamp set. My mother had planted mums in our front yard, and I drink chrysanthemum tea (which is popular with Chinese people). The sneak peek is right – the images are so organic. I love that style. Love the Thanksgiving cards and sympathy sets. Great projects. The mums are beautiful. I love the ones with the watercolor wash. The sympathy sentiments are really nice, too. I loved the water coloring of the Mums; what a great effect! Beautiful projects presented today! I can already tell that it is going to be difficult to buy on a budget this month. You are just as impressed with the beauty of such variety of flowers . . .just lovely! Another day of beautiful projects–love, love the mum set. I can’t wait to see everything. What a beautiful job you have presented so far. Tantalizing release. Can’t decide so ill have to get them all! Wow, the Basket of Blessings set is amazing! And the Rustic Burlap Impression Plate and Background Basics: Morocco set seem like musts for my collection! Amazing introductions today, love the new floral set and the background of course I new i would love it! Amazing and delightful–simply wonderful! Everything! Love the new rustic burlap impression plates. Gorgeous cards today! I love how even the ones that were simple to make are so sophisticated. I think Ashley out did herself! Beautiful! I love the mums! Actually, all the new releases are pretty wonderful!! I love the Moroccan background and the label die! Looking forward to seeing all the stamp images! Beautiful cards. Loved both the sympathy cards. All the sentiments used today were amazing. The basket set is beautiful! Love the mums! The “praying for you” card is stunning! Love it! Excited to see all the new sets on August 15th. The burlap impression plate is a must-have. I just love fall and the products and projects truly make my heart happy! I am loving the rustic burlap impressions folders. They will be a perfect detail for Fall projects. Burlap impression plate tops the list for me. Seems like there is always one month when every single item ends up on my wish list – this is that month for me! I am loving all the Thankful quotes and am so ready for fall! Your cards are just gorgeous! Love that basket of flowers! 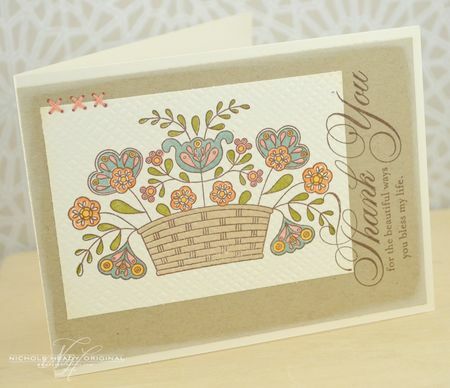 Love what you did with the flower basket stamp! Very creative! Wow! Such beautiful cards today! I am very excited about this release! Love those mums and the burlap impression plates!!!!! Great releases this month. Love it all. Thanks. Very inspiring cards! Thank you! I really liked the basket of blessings, especially with the sentiments and the Moroccan background is very, very pretty! AND I love the new impression plate. You never fail to amaze me. I love your inspirations. Love that background basics set! Extremely cute. Love everything. Can’t wait to stamp. Love the new Morocco set! Thanks for the chance to win. Beautiful new goodies! Would love to have them! Thanks for the chance to win.. I love the Mums, and the basket is just beautiful: I can’t wait to see the complete sets!! Oh, I love that basket and its beautiful flowers. Stunning projects!!! Great projects by all the DT’s. Mum’s the Word set is gorgeous and all the projects today are amazing! I can’t wait for the 15th! Such beautiful stamp sets this month. I love Mums the Word. So many possibilities! What beautiful fall sets! I love the baskets and the mums! What wonderful goodies you’re showing us–you really do know your audience LOL!! LOVE the mums and the sentiment stamps…hmmm how to choose…eeny, meeny, miny, moe…Thanks design team! Really excited to see the burlap impression plate. The moroccan background is really pretty too. Can’t wait to get it. I love the new sentiments for Thanksgiving! Any stamp with a coordinating die makes me happy! Quick and beautiful mums! I like the Mums and a clean & simple look, so my favorite cards today are Praying for you and Happy Fall. So pretty! Also looking forward to seeing more of the burlap impressions. Thanks! I just love the basket set what a fabulous set for any occassion. Elegant Sympathy set, need this. That basket is adorable! Such a great release! What beautiful and colorful projects! I really love the Thanksgiving card! The basket and blooms are gorgeous! Love all your projects, as usual! The watercolour card is beautiful. Great technique idea. I love all the details on the basket! I especially love all of dawn’s boutique border sets and it will be good to have a sympathy one in my stash! So stunning! Love the DT work! Wow you are going to have a great new set of stamps. These are amazing flowers and very versatile.